New season nothings changed we were terrible again.On that a effort it will be a massacre next weekend against Norwood. southern bulldog wrote: New season nothings changed we were terrible again.On that a effort it will be a massacre next weekend against Norwood. we gave ourselves a chance.Also probably had most of the play in the last 10 mins of the 2nd qtr but just couldnt score. Great win by the Panthers today. Goes to show that while our trial game form was poor it counts for nothing when the real stuff begins. Always a tough game against the Dogs anytime, and today there were periods where they were dominant but failed to hit the scoreboard. 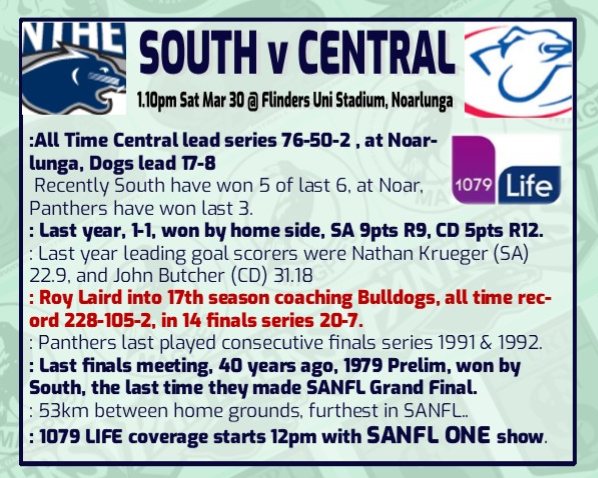 Despite that South IMO never looked like losing and after 3/4 time ran away to a 10 goal victory. I have a feeling there wont be too many 10 goal margins this year for anyone. Cross had 35 touches and kicked 3 goals- there's 3 Magarey votes to begin the season! The team all played well but I was particularly impressed with Schwartz's return and Whittlesea as a lead up forward. Liddle was as usual all class and Crabb was good in defence. Plenty of tough games to come, but a good start to the year, Go Yeohs!